New Zealand – Live In Our Skinz! Many people believe that putting their sunscreen on once a day will protect them from skin damage, UV exposure and ultimately skin cancer. This is not true. Sunscreen must be reapplied at least every two hours, less when in and out of the water. Wearing a wide-brimmed hat, sunglasses, UV protective clothing and avoiding the peak hours of the day are also other ways to protect your skin from sun damage, sunburn and skin cancer. 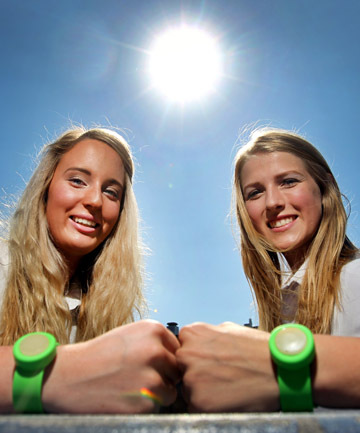 Wearing Exposure Bands would be a fun way to keep track of sun exposure and a subtle reminder to reapply sunscreen. Children would especially benefit from this product; giving them independence in their own sun safety with less nagging from Mom to put on more sunscreen! Extreme levels of ultra-violet (UV) radiation caused by clear skies and bright sunshine kill between 250 and 300 Kiwis a year, giving New Zealand the highest death rate from melanoma in the world. However, there may be cause for celebration, with some scientists believing that by the second half of this century the rate will be falling. The maximum value of the UV index which at this time of year can reach “extreme” levels of 12 over the South Island and 13 further north would drop by two or more steps under such a scenario. National Institute of Water and Atmospheric Research scientist Greg Bodeker said the peak in the skin-cancer rate was expected about 2040. Beyond that, increased ozone concentrations were likely to take New Zealand and the rate back to where it was in the 1950s or 60s. “Skin-cancer rates of today are caused by UV exposure 20 or 30 years ago. Some people were concerned that if UV radiation levels fell lower than so far experienced that might lead to vitamin D deficiencies, but that seemed unlikely, he said.